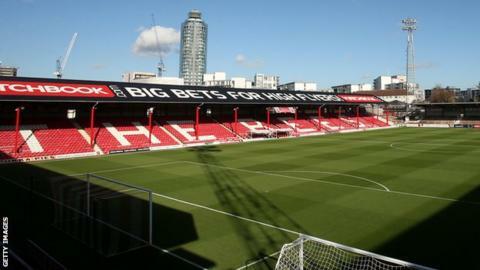 Brentford have confirmed they may have to move away from Griffin Park and groundshare if they are promoted to the Premier League this season. The west London club's stadium does not currently satisfy top flight standards. "Griffin Park falls short of meeting Premier League requirements in some areas," chief executive Mark Devlin told the club website. "We are looking at creative and innovative solutions to meet those requirements." Every Championship club has to submit plans to the Premier League board before 31 January, detailing how they will meet a series of requirements set by the Premier League. They include the size of media working areas, levels of floodlighting, the provision of undersoil heating and dressing rooms meeting specific dimensions. The Bees, who are currently fifth in the Championship table having been promoted last season, have played at the 12,763-capacity Griffin Park since 1904. Brentford have planning permission to build a new 20,000-seater stadium at Lionel Road, but they are unlikely to move to that ground before the start of the 2017-18 season. "Our primary aim is to stay at Griffin Park until our new stadium at Lionel Road South is complete, whatever division we are playing in," Devlin added. "Every Championship club has to submit their plans for meeting Premier League rules and we are working on that now. "Clubs will be required to put these in to action upon promotion so it is not an exercise to be taken lightly." Devlin said the Bees had the option of a groundshare elsewhere, but said they had not had talks with any clubs. "If a groundshare is required the club will consider all stadiums in the local area, both those currently used for football and not," he said. "I should stress that no conversations have taken place with any other club or third party. "Club representatives have only spoken to the Football League in order to ensure we complete the document by 31 January."